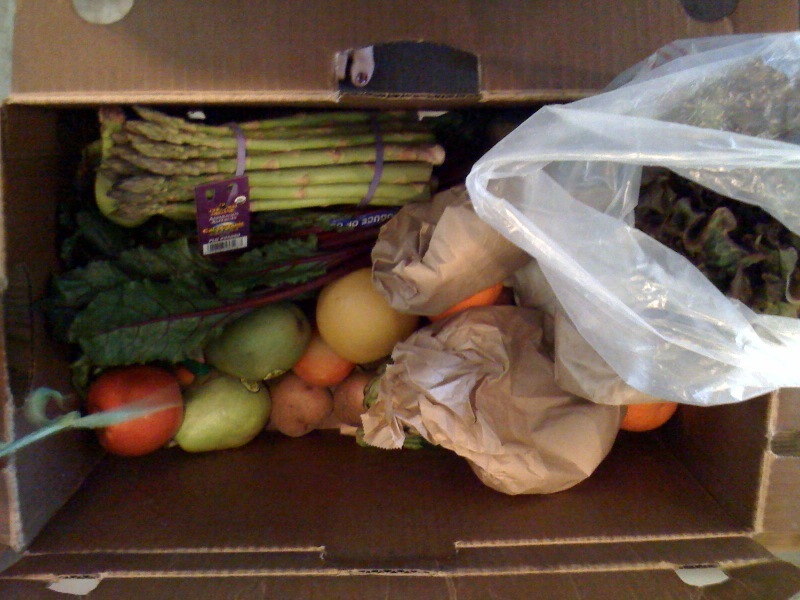 We started getting organic fruits and veggies delivered to our door weekly. We’re using LOVE delivery. It’s our third week and I love it so far. You can custom order your box or take what they have for the week. I like to do both. One week I select the things I specifically need for recipes. It’s so easy to grocery shop from home with all my cookbooks in front of me. No more forgetting lemons or mint or thyme! The following week I’ll take what they have. This forces me to learn to cook with items I’m not familiar with. This week I’ll figure out how to make red chard. We also got a yellow sort of squash thing. I’ll need to figure out what it is. This ignorance about a veggie made me think of a speech Jamie Oliver did about the sad state of our American diet and food. The speech I saw was for the Ted Award but he’s now turned it into a series on ABC, Jamie Oliver’s Food Revolution. In the speech he plays a video of school kids who were shown veggies like potatoes and cauliflower and they don’t know what they are!!! Where do these people get their food? It makes me irate to see how irresponsible some parents can be with their children. Then I realize how blessed I am to have been raised by hippie organic parents. What we ate was super important to them and I’ve brought that thought with me to my family and added upon it. I’m trying hard to educate P on food; from what it is to how it tastes and how it incorporates with other ingredients. Last night I made an amazing butternut squash soup. It had vanilla bean in it. I generated the excitement for P by saying “wanna see something cool?”. “Mamma, I wanna see someseeing koooool!” We sat down at the dinner table to split the bean and scoop out the seeds. P tasted it, held it, sniffed it. When we added it to the cream she tasted it again. I told her these were the basic ingredients to vanilla ice cream. The soup took on a new meaning when she ate it. I generally don’t need to entice her to eat butternut squash soup and this recipe became even more exciting with the dark, tiny seeds floating in the cup. When I first moved to LA I knew a woman who was an amazing cook. The rest of her left much to be desired but she did have this one great quality. Her children, all in their early 20’s, never set foot in the kitchen. They either hated it or said they had no talent for it. I’ve always wondered how can this be? How can you be so good at something that’s such an integral part of life and not pass on some degree of it to your children? I sense that what happened in this scenario is that the mother took over the cooking. She didn’t want her children to try it and criticized them when they did. I heard her mock their skills several times. I know I’m pretty good in the kitchen. I at least love cooking and I always get compliments…maybe only to my face. Anyway, I didn’t realize I loved cooking so much until I had P. So, because of what I saw with this family I make a conscience effort to incorporate P in the cooking process daily. She wants to be in the kitchen so I try to find something she can do to feel part of the meal preparation. It’s not easy by any means but I want her to feel comfortable and skilled in this arena. At the very least, it’s a sure fire way to land the guy you like. Ask my husband.